We, that is mankind, are undoubtedly a paradox. On one hand we crave peace but on the other we invest vast amounts of our time, resources and creativity either engaging in war or preparing for it. Peace, it seems, is something we crave but its permanence is elusive. The idea that all war is forever over and that swords will be put to a more peaceful use is appealing, but seemingly ever beyond our grasp. The actual forging of weapons into a better purpose seems far fetched, so it will surprise you to know that today we literally are doing this! Medical Scanners are being made from old WW2 and pre-WW2 Battleships. But why ? World War II saw many mighty ships sent to the bottom of the ocean where they have, up until now, largely remained untouched. However, some of these ships have since been stripped of their steel, to be used in building medical and physics equipment. It’s not because there’s a shortage of steel, but because this steel has a very unique property that modern steel doesn’t have. Let’s begin with explaining briefly how steel is made. The process is pretty simple. Iron ore, mined from the ground, contains a lot of impurities and carbon, which act to make the iron weaker. 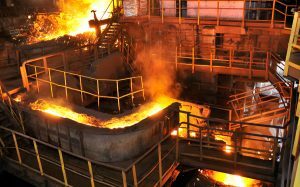 To remove these unwanted materials, the Iron is heated up in a blast furnace until it becomes molten, before limestone is added to the mixture. The limestone floats on top of the molten iron and draws out the impurities and some of the excess carbon from the iron mixture. Air from the atmosphere is used in the process to help remove impurities from the iron ore. These impurities are then drained away, leaving iron with a small, controlled amount of carbon in it – this is steel. At 5:26 am on the 16th of July 1945 in the Jornada del Muerto desert, about 35 miles (56 km) southeast of Socorro New Mexico Steel production changed forever. It was at this moment that the US detonated the first atomic bomb and man made radioctive particles were released into earth’s atmosphere. The trinity test, as it was known, was shortly followed by the detonation of the 2 bombs at Hiroshima and Nagasaki ending the second World War. Since then there have been around 1,900 atomic weapons tests , with each of these explosions releasing further radiation and radioactive material into the atmosphere. Today if you want to build a sensitive radiation detector, such as a Geiger counter or a medical radiation scanner then to get the most accurate readings you have to make sure none of the components inside the detector are themselves radioactive, otherwise your detector will be less sensitive. This then is where problems start with modern created steel. Because air is passed through iron to make steel, any radioactive particles in the air which are leftover from the nearly 2,000 nuclear detonations over the years will become part of the steel. This makes all modern day steel, made using atmospheric air, ever so slightly radioactive. Consequently this steel can’t be used in any type of sensitive radiation detector, including medical scanners. Use a modern technique to allow us to make steel without including the radioactive impurities of the air. However, this process is very expensive. Use steel that was made before the first ever atomic detonation, also known as low-background steel. This means, we can only use steel that was made before the 16th of July 1945. Any steel made after this day has a chance of containing radioactive particles. Of course in 1945, most produced steel went in to making ships and tanks for the war effort. This makes sunken ships, which have lain untouched under the sea, one of the only reliable sources of non-radioactive steel. Being under the water has also protected the steel from being directly exposed to any radiation, as water is a very good insulator against radioactive particles and energy. 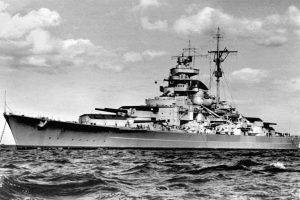 Consequently, due to the expense, when we need to make medical or physics equipment out of steel which needs to be very sensitive to radiation, we often have to use steel from sunken battleships. Of course over time as the amount of low-background steel that exists becomes scarcer the cost will rise and we will eventually have to make all our steel with the (currently) difficult and expensive way.